Are You Being Actively Recruited to Play College Sports? What does it mean to get actively recruited? This is a topic that constantly pops up when our team of college recruiting advisors has conversations with college coaches and student-athletes and their families. Most families think their child is getting actively recruited if they are receiving emails or letters. This is WRONG and a common myth that continues to exist in the college recruiting process. Being actively recruited depends on where you’re at, freshman, sophomore, junior, or senior year. 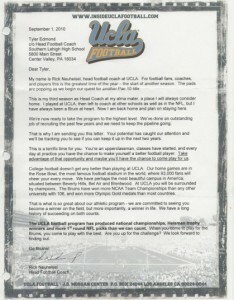 “Blanket” emails and letters are being sent to often hundreds, and sometimes thousands, of student-athletes by individual college coaches. After July 1st of your junior year, college coaches are allowed to call you. If you’re a junior or senior and you are aren’t receiving phone calls, and still just receiving emails or letters in the mail, that means you’re not being actively recruited. Getting actively recruited is a common myth that usually costs many student-athletes the chance to maximize their college recruiting opportunities. One of our college recruiting advisors, Nate Nelson, who played football at UC Davis, tells this story over and over again. He came out of San Diego as a pretty solid football player. He started getting letters as a sophomore and as a junior. He thought, “Oh this is great, I’m going to get recruited my senior year!” Next thing he knows, his senior year season has gone by. It’s the spring after his senior year of football and he’s got nothing. There are no offers. No schools are interested, no opportunities, and he’s scrambling to find a school that would be a good fit for him. What was actually happening is, he was being marketed to by these various college programs. The school that he ended up going to was a Division I-AA school called UC Davis. It ended up being the exact right fit for him both athletically and academically. It ended up being a great choice for him. However, the stress that he and his family had to deal with as being an unsigned senior was almost unbearable. This is what we try to help avoid.